In building a static site with MetalSmith, content is created in the source folder, and metalsmith manipulates this content using specified plugins. The manipulated content is contained in the output or build folder. This folder is served on the browser. Running npm init initializes a new project and creates a package.json file. metalsmith-templates: We would be making use of Jade — a template engine. This would be used to write our source HTML files. metalsmith-collections: This helps us create grouped content lists like article lists on our page. metalsmith-permalinks: This customizes permalinks of files. The — save flag ensures these plugins are created as dependencies in our package.json file. Note: The "scripts" property is included so we can configure server commands for our site. When we run the build command, the build files are generated on the server. Running the serve command serves a locally hosted version of our website. 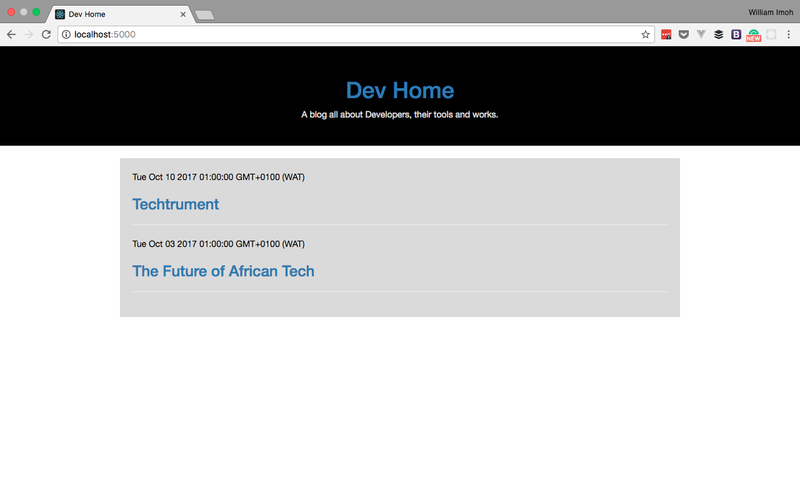 The build.js file is yet to be created. Next, these loaded plugins are chained to the metalsmith function with the use() method. Required parameters are also passed in the methods. Note: The order in which these plugins are chained is very important, as the source files will be manipulated by these plugins in that exact order. Note the source, template, assets, and destination directory as specified. After the plugins are chained, an error function is also declared in case of an error. This is located at the bottom of the script as seen above. We now have our metalsmith engine in place.Now let’s get to creating our templates for the homepage and our articles page. Note: Bootstrap is used for styling and is imported from a CDN to the head tag of the file as seen above. Feel free to style it anyhow you like. In the index.html file, there is no HTML content; rather, we have front matter - this simply displays information usable from the page. In this case, the front matter states we use the index.jade template to render the HTML file. We are all about set with our blog. Now let’s get to the best part - creating content for the blog. Content is created in the form of markdown files that will be translated to HTML files (remember the metalsmith-markdown plugin). In /src/articles, two markdown files are created, which will be our sample articles. The front matter in the markdown files will be used to fill in dynamic content on the HTML files. Take a look at the article.jade file to see the value of title, author and date passed in. In this article, we have built a static blog using MetalSmith. 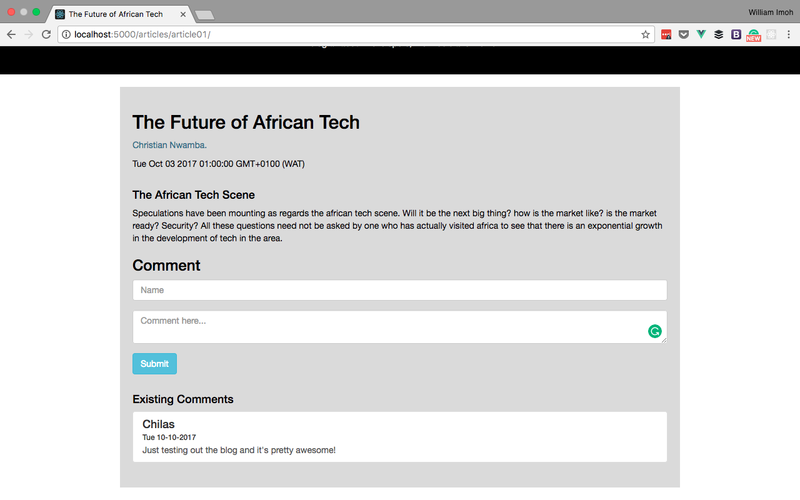 Using just the basic plugins, we implemented features required of a static blog that includes an articles list. 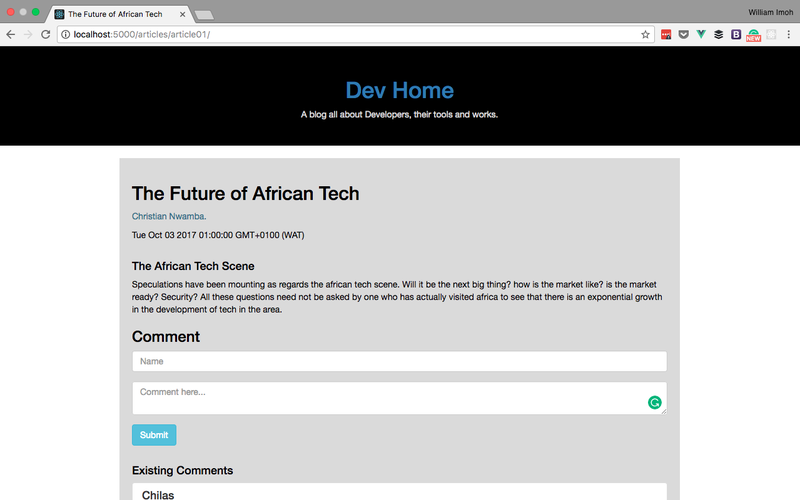 Also, Vue.js was used to create a commenting system on the blog. Feel free to try out other template engines instead of Jade, as well as modify the styles on the blog.